Quilt designer, teacher and author, Sharon Wilhite, specializes in using innovative techniques, timesaving methods and technology to create spectacular quilts. She has designed quilts for Elizabeth's Studio, Exclusively Quilters, Hoffman Fabrics, Robert Kaufman Fabric, and Timeless Treasures. She also developed the Reflection technique, a quick and easy strip cutting and piecing technique that creates a stunning variation of a kaleidoscope quilt. Quilting since 1989, Sharon started designing quilts in 2005. She specializes in distinctive quilt patterns, as well as innovative and time-saving techniques. Her patterns are suitable for sewists of all skill levels, from beginners to more advanced quilters. Sharon’s book, Bending the Rules, features a technique that lets you apply a simple process to almost any pattern to give it more movement and added appeal. 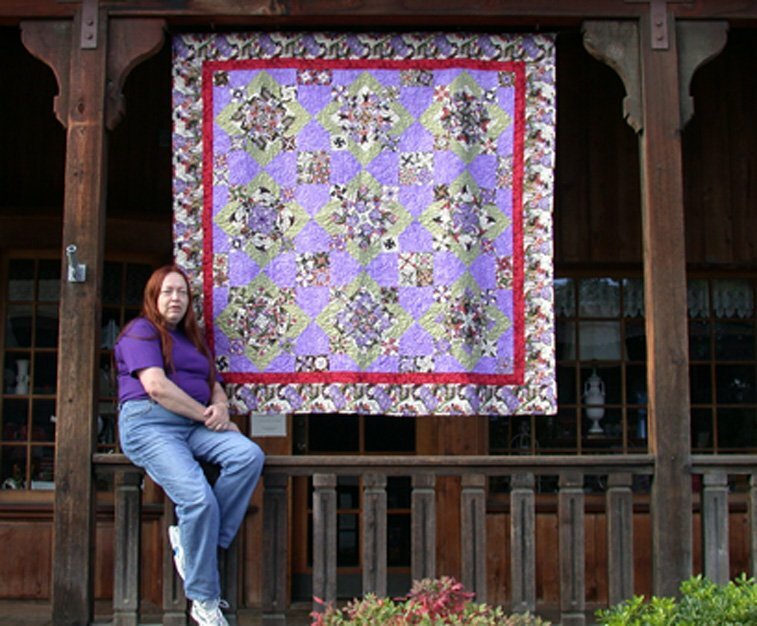 Below, Sharon as the featured quilt artist at the Valley of the Mist Quilters Quilt Show held in October 2006, in Temecula, California.